Note : The events on this page are all PAST events. 13 Jan 2007 Hove East Sussex 'Water: Too much or too little in Sussex? ', 10.30am to 1pm, Church House, Hove, East Sussex BN3 4ED. 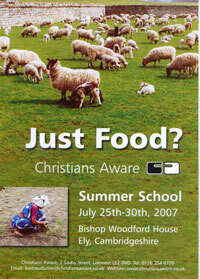 Organised by CEL, Chichester Diocese Church & Society Dept, Arundel & Brighton RC J&P Commission. Details: Helen Swyer, Church House, 01273 421021 or justice-and-peace@dabnet.org . Renewable Energy: at Wardie Church , Edinburgh with Jason Leon, renewables advisor for the Scottish Community and Householder Renewables Initiative (SCHRI), on alternative energy sources that can be installed on a domestic scale. All welcome. Thur 18 Jan Oxford 12.30 pm. 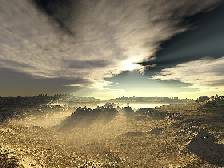 Six Degrees: Life on a hotter planet. Mark Lynas, New Statesman. One of the Changing the Climate St Giles lunchtime lectures, Hilary Term 2007. This lecture will take place at St Giles Church, St Giles, Oxford. 19-21 Jan 2007 Ringsfield EcoStudy Centre, Beccles, Suffolk Storm of Hope An invitation to enjoy and explore the meaning of community for CEL members and others at Ringsfield EcoStudy Centre for CEL members and others 01502 713020 Cost: £72 inclusive . 22 Jan Yatton, N Somerset An Inconvenient Truth Revd Cathy Horder is putting on a showing - at the Chapter House at St Mary's Yatton, North Somerset. 25 Jan Oxford 12.30pm. Climate change and development. John Magrath, Oxfam GB. One of the Changing the Climate St Giles lunchtime lectures, Hilary Term 2007. This lecture will take place at St Giles Church, St Giles, Oxford. Th 25 Jan Kenilworth St John's Church Kenilworth Josh Neufeld from Warwick University speaking about Climate change 7.30pm "Global warming: is it hot air or are we in hot water?" Josh is a Post Doctoral Research Fellow at Warwick University. 28 Jan Salterforth, Lancashire 11.15. Ecumenical Service (Joint service for Kelbrook, Earby and Salterforth) on "How can the churches care for the environment?" theme. Guest Speaker: Judith Allinson . 29-31 Jan Woodbrooke, Birmingham A conference at Woodbrooke, Birmingham run by Quaker Green Action, mainly for Quaker organisations and meetings. Cost £140 Contact Laurie Michaelis at laurie@livingwitness.org.uk for details. Thur 1 Feb Oxford 12.30pm. Managing the impacts of climate change. Dr Chris West, Director, UK Climate Impacts Programme. One of the Changing the Climate St Giles lunchtime lectures, Hilary Term 2007. This lecture will take place at St Giles Church, St Giles, Oxford. LIVE THE COOL LIFE-IMAGINING A GREENER SHEFFIELD Open Climate Change Conference (free entry) St Mary's Community Centre, Bramall Lane, Sheffield- A chance for Sheffield people to have their say and discover practical steps to combat climate change locally and globally. Fri 9 Feb Oxford 7.30-9.30 pm. St Andrew's Church, Linton Road, Oxford. Revd Margot Hodson, chaplain of Jesus College and a director of the John Ray Initiative, and Dr Martin Hodson, Principal Lecturer in Environmental Biology at Oxford Brookes University, will speak on "Climate Change - a theological and practical response" . The meeting is organised by the Oxford branch of Christians in Science . Contact Diana Briggs . Sat 10 Feb London Network for Peace AGM and speaker. Guns and greenhouse gases: War, Peace and the Environment Conway Hall, Red Lion Square, London. mail@networkforpeace.org.uk www.networkforpeace.org.uk Speaker - Dr Stuart Parkinson of Scientists for Global Responsibility. 8.10-8.50a.m. Radio 4 Sunday Worship will be live from Jesus College Chapel , Oxford, UK. Sir John Houghton will be preaching, and will give a Christian response to Climate Change . Admission is by ticket. If you would like to attend please email info@sageoxford.org.uk Note this service will be available to listen to on the Radio 4 website for about a week after Sunday 11th. "God is Green", Channel 4 at 8pm follows acclaimed documentary-maker and recent environmental convert, Mark Dowd, on a personal journey to find out why, despite climate change becoming an increasingly vital issue, the world's major faiths are saying so little about it. Mark talks to leaders from various faiths including Islam,Catholicism, the Church of England, evangelical Christianity in the USA and Hinduism. 13 February Melksham Introducing 'Fit For Our Children'Location: St Anthony's Church Room Address: Melksham SN12 6HJ 7.30 pm An introductory evening to the book, 'Fit For Our Children' with Fiona Hulbert the Coordinator of Centre for Faith and Action in Society. 'Fit For Our Children' has been produced by Wiltshire Churches Together in partnership with Wiltshire Wildlife Trust. It is a practical guide demonstrating how congregations and individuals can respond to various 'green' issues including transport, water, wildlife, trade justice and recycling. Thur 15 Feb Oxford Thursday 15th February 2007- 12.30pm. The church, theology and climate change. The Revd Dr Andrew Bunch, Vicar of St Giles and Dr Paula Clifford, Christian Aid. One of the Changing the Climate St Giles lunchtime lectures, Hilary Term 2007. This lecture will take place at St Giles Church, St Giles, Oxford. 17 Feb Portsmouth Bishop Challoner School Basingstoke Portsmouth Justice & Peace Day- The Environment and Fair Trade - Becoming stewards of God's Creation 01329 835583 Booking essentialMary Colwell, BBC Environmental Expert and Mark Woods, live simply Co-ordinator. There will be a series of workshops including Fairtrade in Schools, Youth Justice & Peace, Greening Parishes, Climate Change, Stewardship, Recycling, Creation and Sustainable Buildings. There will also be a fairtrade market throughout the day. which will end with mass with Bishop Crispian. DEVELOPMENT – why not attend one of our short intensive courses in London? 22 Feb Oxford 12.30pm. Climate change and biodiversity. Dr Mike Morecroft, NERC Centre for Ecology & Hydrology, Wallingford. One of the Changing the Climate St Giles lunchtime lectures, Hilary Term 2007. This lecture will take place at St Giles Church, St Giles, Oxford. 55 past events incl 2 lent announcements At 24 Feb 2007: There are 50 upcoming events in March. There are 146 upcoming events in 2007. THis year already 200 events have been announced (In 2005 and 2006 the total for at December was about 220 each year. Tunbridge Wells Christian Aid Action Group: Facing Climate Chaos Are you concerned about climate change? Want to know what you can do about it? Then come on to St Paul's Church Centre, High St, Rusthall, at 3 for 3.15pm and meet REBECCA RUST Christian Aid, PHILIP CLARKSON WEBB, Church in Society and other consultants, to be confirmed. Simulations, workshops, exhibition and discussion. Admission Free - FAIRTRADE refreshments. 01 273 470 514 or southeast@christian-aid.org PS There will be special workshops for Year 6 and 7 children from seven invited schools - hence the starting time! 12.30pm. Climate change: the final straw for tribal peoples. Gilbert Oteyo, Pitt Rivers Museum, Oxford. One of the Changing the Climate St Giles lunchtime lectures, Hilary Term 2007. This lecture will take place at St Giles Church, St Giles, Oxford. Arthur Rank Centre Managing the Social Impacts of Change in Agriculture arcadmin@rase.org . 3 March Bath and Wells On 3rd March Bath and Wells Diocesan Synod will be debating a proposed environment policy. This is the result of a year's work by a working party set up by the Bishop's Council in early 2006. The working party consulted very widely across the diocese and has now produced a report which includes a basic commitment, a vision statement, supporting papers giving the theological and ecological basis for the commitment, and resource papers. David Osborne, in Bath and Wells Diocese, has set up an e-mailing list for a periodic eco-newsletter. This will be a way of passing on information about local and national green events and other matters. The first letter was sent to all clergy and churchwardens in the diocese with a request that if they wanted to receiving further editions they should specifically ask. This was to avoid the letter becoming a kind of green spam. Within five days, 75 people had signed up for the next one. If anyone else in Somerset, Bath & North East Somerset or North Somerset would like to receive it, please contact osbornepilton@ukonline.co.uk. 5 March Channel 4 "God is Green", Channel 4 at midnight (repeat) follows acclaimed documentary-maker and recent environmental convert, Mark Dowd, on a personal journey to find out why, despite climate change becoming an increasingly vital issue, the world's major faiths are saying so little about it. Mark talks to leaders from various faiths including Islam,Catholicism, the Church of England, evangelical Christianity in the USA and Hinduism. This is a major consultation during Fairtrade Fortnight exploring Farming and Fairtrade - in the broad context of global trade justice. The Keynote Speaker is Colin Tudge well known for his books (So Shall We Reap) and essays on farming and the environment. Further speakers on Fairtrade, food production, and there are a range of practical and informative workshops, including setting up a Fairtrade town or village, buying locally, food security, farming experiences and so on. Beauty of the Earth. Dr Edward Echlin discusses this from a theological perspective. Michael Dunn shares more of his wonderful photographs. A selection of poems from Dawn Coull and David McAndrew entitled"Green Words Celebrating the Earth"
7 March Upper Tooting, London What does the environment have to do with Christians? Be Inspired.Be Inspiring! Be a Climate Change Champion!! (.or just find out more!) Do you care about God's creation? Would you like to learn more about energy efficiency, renewable energy and environmental opportunities for your home and church? How to do an audit? How to inspire and engage others in your church? Where to start! Inspired by visits to the Tate Modern and London churches, a group from St Peter's Bexhill are launching an alternative worship service, called "the hill", at 8pm. With a theme of the faith and the environment, the service will pose questions and provoke thought using art installations, music and video. "This service is aimed at everyone - especially those who wouldn't normally be attracted to church", said Jason Newton who is one of the team planning this ambitious project. "We are very lucky to have the support of the Mother's Union , spearheaded by Zoe Smith who is involved in a nationwide environmental campaign with the group. St Wilfred's Threshold 7.30pm "Waking to a New Earth-2".The overall theme is essentially ecological. speaker and discussion evening. Venue: Holy Trinity Church crypt. STEWARDS OF CREATION - a joint Lee Abbey / A Rocha conference - with Dave Bookless, Prof. John Bryant and others. Book via www.leeabbey.org.uk or 0800 389 1189. We're hoping A Rocha Friends will especially come to meet each other at this conference. *** There will also be a small group focussing on PAINTING & CREATION led by Rachel Woods - contact Lee Abbey directly if you are interested. Earthing Worship 20 - 23 March £152 Jeremy Clines How might our relationship with the land connect in a more meaningful way with our expression of worship? During these few days we will join our voices to that of creation in praise of God and be conscious of creation joining us in 'groaning for liberation'. The course will include the chance to get involved in hands on work on the land. Jeremy is a practical theologian and chaplain involved in workplace ministry. This course is aimed at those who have experience of Christian worship, from whatever tradition, and who are seeking to find that expressed in their concern for the environment. c.113 past events incl 2 lent announcements At 6 April 2007: There are 23 upcoming events in April, 25 in May, 19 in June, 13 total in July and August, 12 in Sept, 8 in Oct-Dec making a total (so far) of 100 upcoming events upcoming events in 2007. This year already 212 events have been announced (In 2005 and 2006 the total for at December was about 220 each year. ..
19 April Sutton Courtney, Abingdon, Oxfordshire Down to Earth Series Compassionate Farming: an Islamic Perspective Lutfi Radwan,local organic farmer and former university lecturer, will talk about the spiritual inspiration for his work at Willowbrook Organic Farm, where he and his family have created a bio-diverse and sustainable farm committed to high standards of animal welfare. Dales Walks £196 Holiday course at Scargill Conference/Retreat Centre. with Eric Parkinson. Enjoy the varied landscape of the Dales in the spring, appreciating both the forces of nature and the influence of the people who have left their mark upon it throughout the ages. 21 April Oakwood, Derby Derby Diocese World Development Day and launch of the Diocesan Environmental Framework People, planet and polar bears - a Christian approach to climate change. Sun 22 April Lelant Cornwall Visit to Churchyard at St Uny in Lelant 2.30pm (SW548375) Part of the Living Churchyard Scheme. Botany 'survey' and walk on the beach afterwards. c.133 past events incl 2 lent announcements At 26 April 2007: There are 5 upcoming events in April, 28 in May, 21 in June, 14 total in July and August, 15 in Sept, 8 in Oct-Dec making a total (so far) of 93 upcoming events upcoming events in 2007. This year already 226 events have been announced (In 2005 and 2006 the total for at December was about 220 each year. ..
c.142 past events incl 2 lent announcements At 10 May 2007: 31 in May, 28 in June, 15 total in July and August, 16 in Sept, 6 in Oct and 6 in Nov-Dec making a total (so far) of 102 upcoming events in 2007. This year already 244 events (pasty and upcoming) have been announced (In 2005 and 2006 the total at December was about 220 each year. ..
10 May London THE FRAGRANCE OF GOD Reflections on Finding God through the Beauty and Glory of the Natural World By Vigen Guroian - Evening to celebrate the publication of this new book - with an event at Armenian House, 25 Cheniston Gardens, London W8 6TG, at 7:30pm. Vigen Guroian, who will be speaking, is professor of theology and ethics at Loyola College , Baltimore , Maryland . He is the author of several books including Inheriting Paradise (DLT). Light refreshments will be served. Please book on 020 8875 0155 or at HannahT@darton-longman-todd.co.uk . 11 May Harrogate 7.45 p.m. at St Marks Church, Leeds Road Open Meeting followed by AGM of Harrogate and District Christian Ecology Link. Sustainable Development in the Third World. Speakers: Andy and Susie Hart, CMS Mission Partners in Tanzania, draw upon their experiences and explain how environmental considerations are an important feature of their work. 12 May Oxford THE FRAGRANCE OF GOD Reflections on Finding God through the Beauty and Glory of the Natural World By Vigen Guroian - garden party to celebrate the publication of this book - at the House of St Gregory and St Macrina, 1 Canterbury Road , Oxford OX2 6LU , between 1-2pm. Vigen Guroian, who will be speaking, is professor of theology and ethics at Loyola College , Baltimore , Maryland . He is the author of several books including Inheriting Paradise (DLT). Light refreshments will be served. Please book on 020 8875 0155 or at HannahT@darton-longman-todd.co.uk . 12-13 May London C ampaign against C limate C hange INTERNATIONAL CLIMATE CONFERENCE At the London School of Economics, Houghton Street , London WC2 Organised by the Campaign against Climate Change with the London School of Economics and Political Science The biggest climate change talk-in, learn-in and plan-for-action of the year ! 13 May High Bentham (N Yorks nr Lancs nr Cumbria) River Blessing at High Bentham to follow the 9.30am service at St.
13 May Low Bentham (N Yorks nr Lancs nr Cumbria) River Blessing at Low Bentham to follow the 11am service at St. It will be a panel-led discussion, chaired by William Crawley, presenter of BBC Radio Ulster’s religion and ethics programme, Sunday Sequence. What we are hoping to do is facilitate an agreed strategy among representatives of the main religions in Ireland on how to tackle climate change and inspire those in their congregations and communities to do the same. The panel will include Sister Catherine Brennan of the Irish Eco-congregation and Rev Dr Ron Elsdon, rector of St Bartholomew’s parish in Belfast and author of several books on the subject of Christian environmentalism. 19 May Manchester Climate Change: Information for Action10am to 5pm. Methodist Hall, Oldham Street, Central Manchester (opposite Affleck's Palace) Suggested donation: £5 No advance booking- just turn up on the day! Song of the Earth - Singing Sacred Music Workshop from around the World with a focus on trees, led by Michael Deason-Barrow at St. David's Church, Exeter , Saturday 19 th May 2007 .
a GREEN FAIR at Longcroft School, Beverley. c.170 past events incl 2 lent announcements At 22 May 2007: 5 in May, 30 in June, 15 total in July and August, 16 in Sept, 6 in Oct and 6 in Nov-Dec making a total (so far) of 78 upcoming events in 2007. This year already 248 events (pasty and upcoming) have been announced (In 2005 and 2006 the total at December was about 220 each year. ..
21-25 May UK Walk to School Week. This year’s campaign, May 21-25, is focusing on reducing exhaust emissions by Walking to School. Driving to school and back releases, on average, enough carbon dioxide to inflate over 70 footballs! not to mention all the other nasty pollutants such as carbon monoxide, nitrous oxides and particulates. Walking to school is a great way to reduce emissions, while having fun and getting fit. For more information, see www.walktoschool.org.uk or contact your local authority school travel advisor. 27 May Redbridge CEL stall at Redbridge Green Fair, 11.30am - 7.00pm in Melbourne Field, Valentines Park, Ilford IG1 4SF. A community festival organised by volunteers and "its all about the planet - the environment and people!" 30 May Oxford 19:15 for 19:30 (film start), at St Columba's, URC , Oxford. 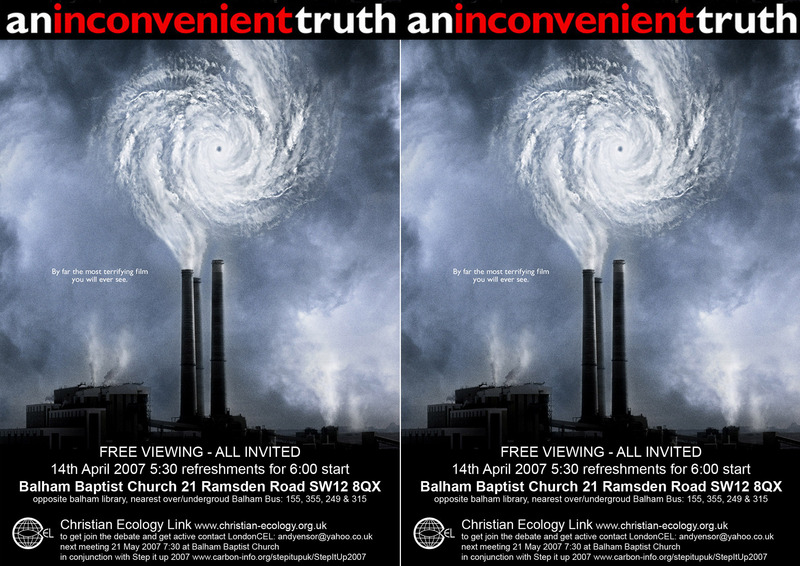 The Faith in Action group, a joint committee of four central Oxford churches (Wesley Memorial Methodist, New Road Baptist, St Michael-at-the-Northgate Anglican, and St Columba's URC), are having a special showing of the film An Inconvenient Truth , with a theological reflection led by the minister at St Columba's, Susan Durber. an 8.00 a.m. ‘Early Bird’ service of meditation at Dalehead Church – for any bird watchers, and other early risers! 3 June Abingdon Christ Church, Abingdon has a service for Environment Sunday - the title is Caring for Creation, and the service is to be taken by the youngest of the childrens' groups. For details contact Richard Riggs . 4-16 June London If you wish to learn more about the issues of GLOBAL ECONOMIC AND SOCIAL DEVELOPMENT – why not attend one of our short intensive courses in London? Sat 9 - Sun10 June Eastham, Wirral Environmental Awareness Weekend at St. David's URC, Mill Park Drive, Eastham, Wirral. Displays, fair trade refreshments and children's activities 10am-4pm Sat, 2-4pm Sun. SWAP day Sat 10am-2pm - bring your unused household goods, leave them for someone else to take away, collect something you need - all FREE. 10 June All over UK - A farm near you. Open Farm Sunday is a national Open Farm Day co-ordinated by LEAF (Linking Environment And Farming) so people can hear and see the positive steps farmers are taking to look after the fabric of our countryside whilst producing safe, wholesome and affordable food. Find out about Farm Sunday events in your area. 10 June Slaidburn Lancashire St Andrew’s, Slaidburn, Bowland Festival Service with Canon Sam Randall and the Slaidburn Silver Band at 11.00 a.m.
c.198 past events incl 2 lent announcements At 15 June 2007: 12 in June, 19 total in July and August, 16 in Sept, 6 in Oct and 6 in Nov-Dec making a total (so far) of 59 upcoming events in 2007. This year already 257 events (pasty and upcoming) have been announced (In 2005 and 2006 the total at December was about 220 each year. ..
c.208 past events At 28 June 2007: Upcoming events: 2 in June, 21 total in July and August, 16 in Sept, 6 in Oct and 6 in Nov-Dec making a total (so far) of 52 upcoming events in 2007. This year already 260 events (past and upcoming) have been announced (In 2005 and 2006 the total at December was about 220 each year. ..
in this series, it will be an informal but very informative event. 1 July London Symposium and Concert Confronting the Crisisof Climate Change CECIL SHARP HOUSE, 2 Regents Park Road, London NW1 7AY. A day-long symposium is being organised to discuss the challenge confronting the human species posed by climate change. A panel of concerned scientists, cultural workers and activists in the field of global warming will present a series of papers and lead discussion. The symposium will be chaired by Dr Alan Knapman. All are welcome Symposium: 1.00 pm – 5.00 pm. Concert: 6.00 pm – 8.30 pm. Composers include: Michael Chant, Robert Coleridge, Chris Hobbs, John Lewis, Michael Parsons, Hugh Shrapnel, Howard Skempton, Dave Smith, John White. GNER cheap rail fares e.g. Leeds-London £10 if you book now. 15 September – Bristol event, College Green 2 October – The march ends in The City of London – join us outside the London Stock Exchange and then at St Paul ’s Cathedral for a final service. Cut the Carbon will be in the tradition of marching against injustice that informed both the Jarrow March for jobs in 1936 and the Nelson Mandela freedom march in 1988. Beginning in Northern Ireland on 14 July, it will pass through Scotland, England and Wales and arrive in London via Bournemouth and the Labour Party conference eleven weeks later. Professor R.J. Berry : author of such books as God and the Biologist and God's Book of Works ; Past President of the British Ecological Society; Chair of the Environmental Issues Network of Churches Together in Britain and Ireland . Steve Hughes, CEO of A Rocha UK : formerly in a senior position with Shell and serving as a Baptist lay pastor, he trained at the London School of Theology before assuming his present role. Jo Rathbone of Eco-congregation : formerly World Development Advisor and Environment Officer for Coventry Diocese. Patterns & Connections: Summer Festival at Scargill House in the beautiful Yorkshire Dales £298 A festival dedicated to exploring the interconnectedness of life in all its wonder and beauty. To include: working with artists and craftspeople, workshops and seminars on personal and community enrichment, world music and dance, and keynote speakers including, Satish Kumar on, 'You are therefore I am - towards a spirituality of dependence' For all who want to celebrate life and think more about their contribution to and responsibility toward the earth. There will be something for all ages and a lot of fun to be had. 2-5 Aug Malvern, Worcestershire Foods of the Earth - The Ninth Resurgence Readers Weekend and Camp Green and Away is Europe's only tendted conference centre. Sun 5 Aug Bristol Clifton Cathedral is holding a unique event before the summer evenings disappear - or even appear! Come to Worcester Terrace Gardens, Bristol, opposite the Cathedral, between 5.00 pm and 6.00 pm on Sunday 5 August and join top naturalist and broadcaster Chris Sperring, Conservation Officer for the Hawk and Owl Trust, as he guides us as we listen to and identify birdsong. There will be time to reflect on our natural world before we celebrate the Eucharist at 6.00 pm. c.233 past events At 25 August 2007: Upcoming events: 1 in August, 28 in Sept, 15 in Oct and 8 in Nov-Dec making a total (so far) of 52 upcoming events in 2007. This year already 285 events (past and upcoming) have been announced (In 2005 and 2006 the total at December was about 220 each year. ..
24-27 August Cheltenham Greenbelt to save 15% discount on online prices book before 31 March . learn more about environmental issues linked to food and the countryside. Why don't city and rural churches pair up an arrange a farm visit for people from a city church? Evening meeting with the marchers, St Katherine's hall, Ledbury, 5:30pm. 15 September – Bristol event, College Green 2 October – The march ends in The City of London – join us outside the London Stock Exchange and then at St Paul’s Cathedral for a final service. 15 Sept London “Earth is Community” – A Celebration of the Vision and Path of Thomas Berry. St Mary’s Venue, York Street , London . W1. Thomas Berry, was one of the greatest thinkers and visionaries of our time. Speakers include Matthew Fox, Vandana Shiva, Satish Kumar, Cormac Cullinan and Peter Reason. . From 9:45am to 5:30pm. Tickets are £39 and there is also an optional lunch for £6 (options are vegetarian, vegetarian/wheat/gluten free or vegan). If you book 4 or more tickets at a time, you will receive the DVD "The Great Story" (worth £20) – free! There are a limited number of bursary places 0845 2235280. Tue 18 Sept Hereford Chris Cole, Director of the Fellowship of Reconciliation, will give a talk entitled 'Take My Breath Away - militarism and the envrironment' at St John's Methodist Church, St Owen Street, Hereford, 7.30. 21 Sept Leeds Schumacher Lectures in Leeds -Speakers include Matthew Fox, the theologian who gave us modern day Christian Creation Spirituality. Satish Kumar, a Jain monk who came to the UK and started Resurgence magazine, and Karen Armstrong, an expert on relations between Islam and the West. Workshops too. Tickets £20 or £10 concessions. JPIC Chapel Service (Justice, Peace and Integrity of Creation)12 noon at Exeter Cathedral, probably on the theme of Water.Devon Churches Green Action display will run for the whole of Septmber in this chapel. 23 Sept Bradford Diocese Bradford Diocese EarthCare Team are encouraging the Diocese to Be Carefree - Have a Car free Sunday' to the idea of 'Slow Sunday'- taking time to appreciate what we have. ECCR open debate WATER SUSTAINABILITY: THE CHALLENGE TO BUSINESS Methodist Church House, 25 Marylebone Road , London NW1 5JR - -4.30-6.00 p.m.
Water shortages because of rising demand, climate change and pollution are increasingly recognised as a key environmental challenge. Countries traditionally considered 'water secure' are increasingly affected. Fri 28 Fareham PARISH ECOLOGY GROUP In Fareham and Portchester Present An evening of celebration- P.E.G. is 5 In the Sacred Heart Hall will be displays and contributions from PEG , Cafod , Life , Fareham Fair Trade Borough , Christian Ecology Link -from 7.30pm. On Sale will be “Save Gods Beautiful World Postcards” (for the Sri Lanka Turtle Conservation Project) and Fair Trade goods . contact@soundofmanywaters.org The Cathedral will host a range of talks, workshops, stalls, music, liturgy and debate about the role of the Catholic Church in the environmental movement. c.273 past events At 1 Oct: Upcoming events: 31 in Oct and 18 in Nov and 4 in Dec making a total (so far) of 53 upcoming events in 2007. This year already 326 events (past and upcoming) have been announced (In 2005 and 2006 the total at December was about 220 each year. ..
2 Oct CHRISTIAN AID – CUT THE CARBON MARCH 2 October 2007 • 11am Gather in the Riverside area next to the City Hall, at More London Place , near Tower Bridge (nearest tube: London Bridge .) Look for the Scoop, where there will be chance to hear from the marchers who’ve completed the whole 1,000 mile trip! • 11.30am Audience moves to Tooley Street to prepare to march. • 11.45am March starts • 12.30pm March arrives outside St Paul ’s Cathedral via the London Stock Exchange, and rally starts. Speakers include international marchers, comedian Alistair McGowan and the London Samba Band. • 1pm Rally ends and people can begin entering St Paul ’s Cathedral (please take your place as soon as possible as everyone needs to be seated by 1.30pm) • 2pm St Paul ’s Cathedral service starts • 3pm Service ends The service at St Paul’s Cathedral is by ticket only on a first come, first served basis and they are going fast; so if you would like to attend then please contact Linda Anderson in one of the following ways: By email landerson@christian-aid.org By post marked for the attention of Linda Anderson, Christian Aid, 35 Lower Marsh, London , SE1 7RT . Please reply by 18 September. Harrogate Christian Ecology Group "Open Forum" St Paul's United Reformed Church, opposite the Library in Victoria Avenue,at 7.45 p.m.
6 Oct Bridgwater The Natural World: A Cause for Celebration & Christian Concern Location: Westfield United Reformed Church, Address: West Street , Bridgwater TA6 7HD, Time: 10.00 am to 4.00 pm - organised by the Justice & Peace Group of St Joseph’s, Bridgwater and aims to provide an opportunity for participants to appreciate the wonder of our natural world; to be better informed about the impact of global warming and to consider our personal response. Speakers:. Mary Colwell is a producer at the BBC Natural History Unit in Bristol and a popular speaker on the environment.. Sat 13 Oct Cheltenham JRI Coffee House Day - at St Matthew's Church, from 10-4.30. 13 Oct St Albans A Rocha SPEAKERS’ WORKSHOP DAY St Albans, Herts A practical day to learn more about speaking for A Rocha. Contact Margaret.young@arocha.org Places limited. 14 Oct Lewknor 2.00-4.00pm. Using your LOAF (and save money) Using local, organic, animal friendly, and fairly traded products is one possible way of living a more sustainable lifestyle. The Chiltern Gateway Project based at St.Margaret's church, Lewknor are holding a LOAF fayre. The fayre is followed by a service at St. Margaret's at which Brother Samuel, project director of the Hilfield 'Peace and reconciliation' centre will be preaching on the theme "Living lightly on the planet". Join the Facebook Event . Sat 20 Oct Crawley Saturday 20 October, Crawley, West Sussex. 'Stormy Weather? Putting Faith into Action on Climate Change', 10am to 4pm, Dabcec, Southgate Drive, Crawley RH10 6RP. Event organised by Sussex Church and Environment Group (CEL and Chichester and Arundel & Brighton dioceses). Details: helen.swyer@diochi.org.uk or 01273 421021. 21-28 Oct - One World Week 2007 This year's theme:, All Together Now Now is the time to unite behind the belief that all people matter; all life matters; the world is abundantly diverse . Now is the time to act; to cut waste and share more equally the world's abundance. 22 Oct Bridgetown, Totnes. St Johns Church, Bridgetown, Totnes. 7.30pm. Free. Transition Town Totnes and Devon Churches Green Action Prayer for the Planet: are we caring for our planet as our faith requires? An Interfaith evening. 29 Oct Balham Balham film and networking event- The Power of Community: Film showing and networking event for anyone in Balham or Wandsworth at The Exhibit, Station Road, Balham First showing 8pm For details visit www.sharedenergy.org.uk and click on the link near Balham event. Film on Cuba- . Cuba made a rapid transition from a highly mechanised agricultural system to one using organic methods and local, urban gardens. c.335 past events At 27 Oct: Upcoming events: 1 in Nov and 6 in Dec making a total (so far) of 32 upcoming events in 2007. This year already 339 events (past and upcoming) have been announced (In 2005 and 2006 the total at December was about 220 each year. ..
5-17 Nov London If you wish to learn more about the issues of GLOBAL ECONOMIC AND SOCIAL DEVELOPMENT – why not attend one of our short intensive courses in London? Monday 12th November 2007- "Avoiding the 'iceberg' of climate change: re-routing the Ark" Anne Pettifor, Campaign Director for Operation Noah. 7-9pm venue Wesley Memorial Church. £3/£2 concs. See www.coinet.org.uk for info. Woking) Refreshments will be provided and admission is free. 17 Nov Scotland A Rocha UK: SPEAKERS’ WORKSHOP DAY November, Scotland A practical day to learn more about speaking for A Rocha. Contact Victoria.beale@arocha.org Places limited. 17 Nov Oxford The Ethics of Climate Change, Blackfriars, Oxford. Several CEL members are speaking at this invitation only event. For more details visit www.bfriars.ox.ac.uk and click on events. Sun 18 Nov Oxford 10.30am. Peter Harris of A Rocha will be preaching on Holistic Mission on in the morning service at St. Aldate's , Oxford. 19 Nov London 19 November Church Times Green Awards Ceremony, St Mary le Bow Church, London. Read about the shortlist. c.335 past events At 28 Nov: Upcoming events: 1 Nov and 11 in Dec making a total (so far) of 12 upcoming events in 2007. This year already 347 events (past and upcoming) have been announced (In 2005 and 2006 the total at December was about 220 each year. So far 30 events have been announced for 2008 ..
1 - 2 Dec London The fairest trade fair of all -The 21st FAIR TRADE FAIR- from 12 noon on Saturday 1st to 6pm and from 12 to 5pm on Sunday 2nd December. Where? - Westminster Central Hall, Parliament Square, London SW1 (on the other side of the road from Westminster Abbey) nearest tubes; Westminster and St James's Park There are 45 exhibitors, including 12 groups that have come directly from Africa (Rwanda, Zambia, Kenya), the Philippines, and elsewhere. It is a remarkable event. There will be world music and there is a reasonably price cafeteria in the same building. Milton keynes Christian Ecology Group event: 7.30pm. Christmas and how to make what we do and buy at this time as green as possible. we'll be hearing about World Vision's alternative gift catalogue, there'll be the opportunity to buy some ethical presents from traidcraft and we'll be sampling an organic locally sourced christmas dinner with all the trimmings. then we'll discuss hints and tips on an eco-friendly Christmas-time; if you're coming bring some ideas to share. Seascale Methodist Church - Eco-Congregation Coffee Morning and Exhibition 10.00 - 12.30 - Exhibition of photographs showing the eco-work done by the Church, Fair Trade tea, coffee, juice, etc, Fair Trade Stall, Other Stalls: The Cumbria Energy Efficiency Advice Centre, Copeland Borough Council Recycling Department, Cumbria Wildlife Trust, Come and collect your free low energy light bulb or radiator reflector panel! Street, London, SW1P 2BU( map ). Great Peter Street runs into Millbank where people will gather for the march. 8 Dec Oxford Sage stand at the Green Fair, Town Hall, Oxford. Sun 9 Dec Oxford 4.30-7.30pm. Eco - Trail by Lantern Light! Brought to you by Aston Rowant National Nature Reserve and The Chiltern Gateway Project . Meet at Lewknor Church after Christingle and set off on an amazing adventure around the reserve to discover the magic of nature after dark! FREE EVENT! Followed by soup and hot drinks in the church from 7pm. Booking recommended. Contact Jenny Crook on 01844 351833 or email jenny.crook@naturalengland.org.uk to book your place! The Christingle service will begin at 4pm at St Margaret's Church, Lewknor, all welcome, contact Rev. Simon Brignall on 01844 281267 for details. c.350 past events At 14 Dec 2007: Upcoming events: 1 in Dec This year already 350 events (past and upcoming) have been announced (In 2005 and 2006 the total at December was about 220 each year. So far 35 events have been announced for 2008 .. The events on this page are all PAST events of 2007.
run weekend and week long holiday courses throughout the year in over 14 different Field Centres in UK on how to identify members of groups of plants, birds, insects, fungi, rocks etc. These are secular courses - but an excellent way to get to know more about plants and animals.